Search for all "DLG4 / PSD95"
Rabbit anti Human DLG4 / PSD95. DLG4 (NP_001356.1, 1 a.a. ~ 767 a.a) full-length human protein. 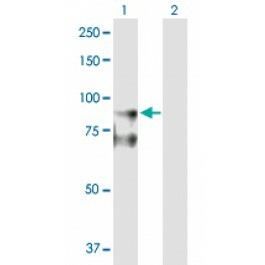 Rabbit polyclonal antibody raised against a full-length human DLG4 protein. Transient overexpression cell lysate was tested with Anti-DLG4 antibody (H00001742-B01) by Western Blots.